Ten years after it started, the New Avengers title has changed concepts several times. It's gone from the only Avengers title to the "street team" book before Jonathan Hickman made it the home of the Illuminati. As a result, it's fitting that Al Ewing, the writer of the similarly malleable-in-concept Mighty Avengers, has taken on the task of defining what the "new" really means for the team. 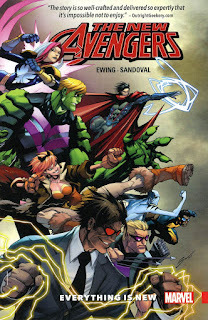 Continuing on directly from the events of Time Runs Out and Secret Wars, the current run of New Avengers follows Sunspot as he operates AIM, which is now Avengers Idea Mechanics, in New Avengers: AIM Vol. 1: Everything is New. The idea of Roberto da Costa buying out Marvel's biggest evil think-tank was a somewhat throwaway plot point to get the Avengers into the Beyonders' realm during the final Incursion. The rich former New Mutant is taking risks even Tony Stark wouldn't have taken at his lowest drunken points thanks to a disease called "M-Pox." I'll discuss it more when I get to Uncanny Avengers, but M-Pox is the debilitating result of Terrigen gas infecting the mutant genome. It's one of the ways the X-Men are being herded away from the main Marvel universe thanks to the ongoing Crisis on Infinite Movie Rights being fought by Fox and Disney. Despite his relatively brief time as an Avenger, Bobby takes on a major role in the Marvel Universe even while his powers are seemingly gone. New Avengers: AIM Vol. 1 -- Everything is New has what might be the weirdest roster since the team was helmed by Gilgamesh and Mr. Fantastic. Ewing uses the book as a way to tie several former and current comic book runs together, starting with Power Man and White Tiger from his own Captain America and the Mighty Avengers. The two young heroes get lost in the mix compared to some of the more outrageous personalities, but it's clear that Ewing has a fondness for the duo and an investment in their future. A character which Ewing created for the Captain Britain and the Mighty Defenders mini-series, Dr. Toni Ho, has also crossed over into the main universe. She's the daughter of Dr. Ho Yinsen and in a relationship with one of Hickman's most underutilized Avengers: Pod. For as much as I loved that era of comics, something never quite worked when it came to the Ex Nihilo/Abyss/Pod plotline. There were hints that "Pod" might have been developed as a new Rom, Spaceknight, but those were dashed once the rights were transferred back to Hasbro and over to IDW. She was also supposed to be the new incarnation of the New Universe's Spitfire, but having her be a monosyllabic robot with an unconscious girl strapped inside derailed that angle. In New Avengers, Pod is Bobby's bodyguard, and she gets more page time than she ever did in Hickman's Avengers. The most conventional member of the team is Hawkeye; ostensibly there to spy on them for SHIELD, he's very open about being a "double agent" and basically joins them because they were around and looking for members. Rounding out the team is Songbird, finally joining after Kurt Busiek predicted it sixteen years ago in Avengers Forever. Genis-Vell isn't on the team with her ... but in fairness, that was a different, previous universe, so things change from time to time. It's part of a trend of making some of the famous Marvel potential futures come true; other examples include the introduction of Arno Stark, the Iron Man of 2020, as well as the Hulk essentially turning into the Maestro in real-time right before Secret Wars. Songbird acts as the team's field leader, and her experience helps her reel in the team's most chaotic member, Squirrel Girl. How bizarre is it that Squirrel Girl is now arguably the strongest draw for casual readers of New Avengers? Ewing does his best to incorporate her without relying on her uncanny ability to defeat gods without trying; it's clear that her presence is a bit annoying to the characters too. Ewing has stated that he wants to create new villains, and the resulting Cthulhu-esque wizard Mor-i-dun makes an impressive entrance along with Ewing's future Avengers 20XX from Ultron Forever. The Maker, once known as Ultimate Reed Richards, is responsible for the weirdest bad guy design of the last ten years of comics, starting with a scorpion body and ending with a floating diamond for a head. The art by Gerardo Sandoval has received mixed reviews from some readers, but I enjoy the stylization. While the artwork is very exaggerated, it works with the energetic tone of the book and with some of the weird things he's drawing as part of the story. It's definitely not as off-putting as Humberto Ramos' art. With interesting and occasionally wacky plots and the right amount of humor -- most of it thanks to Squirrel Girl and to snarky introductory text balloons -- New Avengers: AIM Vol. 1: Everything is New is one of the best-written team titles on the stand right now. In Ewing's eyes, they're the new generation of heroes with the newest tech and the newest villains, even with the numerous callbacks to and continuations of previous titles.